It takes a lot of work to prepare for the school year. There’s the endless back to school shopping for clothes, shoes, and school supplies—but are your kid’s mouths healthy and ready to conquer the school year as well? Their smile should be healthy, shining, and bright for when they walk into their classroom for the first time of the year. If your child has all of the other bases covered for going back to school, get them into visit their Helotes dentist. We can not only get your kids ready to smile confidently on their first day of school, but also offer great dental tips to help you get through the rest of the year with healthy smiles. Dental Care Should Be on Your Back to School To-Do List. A dental examination is as important as immunizations and booster shots and should be a regular part of back-to-school preparations. Well, that’s what the American Dental Association stated—and we agree! Reports from the Centers for Disease Control and Prevention found that tooth decay affects U.S. children more than any other chronic disease. In fact, your kids could end up missing important days of school from dental pain and oral health issues if they skip their preventive care appointments. Schedule your children’s regular dental examination to diagnose and treat or prevent dental problems before the school year starts. Ask your dentist near Helotes about dental sealants and fluoride treatments to strengthen your children’s teeth. Make sure your kids are regular brushing with fluoride-enriched toothpaste and flossing. You can get them interested in their at-home dental hygiene routine by taking them down the dental care aisle after back to school shopping. Considering buying several toothbrushes when back to school shopping. This way, your kids can have a new one every three months or so, or after an illness. If it’s hard to remember when to change a brush, you could try to change it every time report cards come out. Ask your children’s dentist for recommendations on when it’s best to change your family’s toothbrushes out. Provide your kids healthy lunches and snacks. Include portable healthy lunch items and snacks in your child’s sack lunch, including grains, milk, cheese, raw vegetables, yogurt or fruit. If your child eats in the school cafeteria, review healthy, balanced food choices with him before the first day of school. Cut back on sugary foods and soft drinks and stress the importance of staying hydrated with water. Ask our office about custom mouthguards for the student athletes in your family. It’s time to schedule your kid’s next dental appointment. Although you have this helpful checklist to go through before the school year starts, our dental team is here to help prep for back to school season as well. 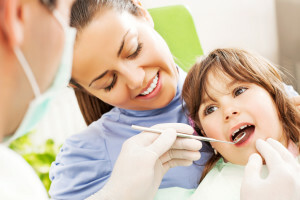 Contact us today to get your little ones in for their next dental appointment.